With National Black Cat Day on the horizon we had some merchandise designed to mark the occasion. 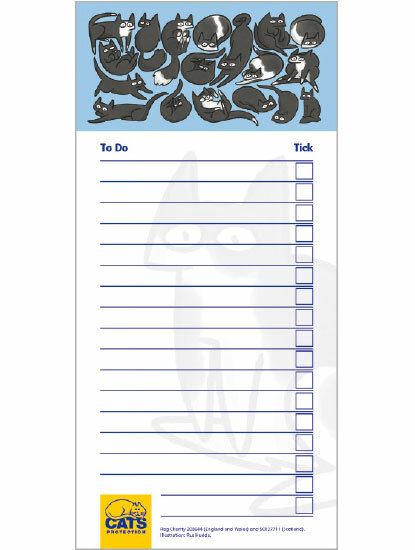 Our Funky Felines mug, list pad and pen feature a quirky cat design by Cats Protection designer and published author Rus Hudda. We caught up with Rus to find out what goes in to creating a new design. So Rus, where do you get your inspiration? I grew up around cats, so they are a big part of my life and I get a lot of inspiration from watching and playing with them. My own cat, Tali, is a daily reminder of why they are such fascinating subjects. Whether destroying toys or taking over my bed she’s always doing something that makes me want to pick up my pen. The way other artists create their work great source of inspiration too. The advent of video sharing sites means I can also brush up on techniques online – there is always something new to learn. How do you go about creating your design? I start by scribbling my ideas in a sketchbook in a very rough form. These can be literal doodles sometimes. Then I move to an iPad Pro to give me a bit more flexibility. I usually sketch a rough layer first, which might include individual cats as well as shapes to show where other cats could go. I plan the layout and build up detail from there. Technology is a big help at this stage as it means I can try things out and make mistakes. It also means I can develop my design easily, scaling and adjusting different elements to get what I need. See illustrator Rus Hudda's work come to life! When the artwork is finished, the design is sent to our supplier who makes it up into a mock up. This is an exciting step as it is the first time we see how the design will look on the finished products. We might make further changes at this stage to get everything how we want it. Once we are happy, we send our approval and production gets underway. The mug is my favourite. It’s fun to see my flat design turned into a three dimensional product. Tea, coffee or something else while you work? 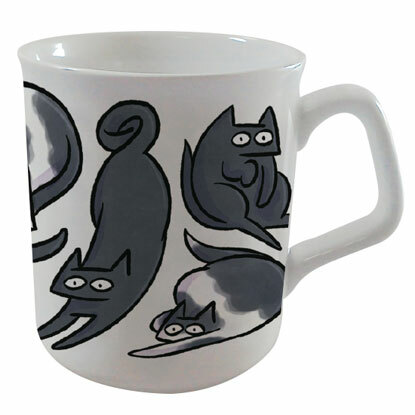 Water please in my brand new Funky Felines mug!